French President Emmanuel Macron is welcomed with a standing ovation during a joint meeting of the U.S. Congress in the House Chamber with U.S. Vice President Mike Pence and Speaker of the House Paul Ryan (R-WI) at the U.S. Capitol April 25, 2018 in Washington, DC. 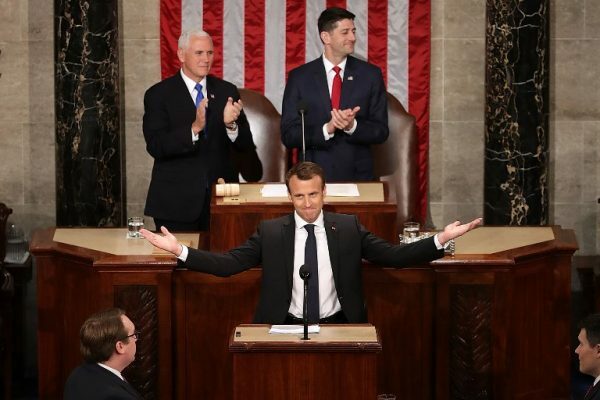 French President Emmanuel Macron urged the United States to reject narrow nationalism and engage the world, telling U.S. lawmakers on Wednesday that modern economic and security challenges must be a shared responsibility. Capping a three-day visit to the United States, Macron told a joint meeting of Congress that isolationism and nationalism were “a tempting remedy for our fears.” But he said international engagement was the only solution. “This requires — more than ever — the United States’ involvement as your role was decisive for creating and guarding today’s free world. The United States is the one who invented this multilateralism. You are the one now who has to help preserve and reinvent it,” he said. Earlier on his visit, Macron pushed President Donald Trump to salvage the Iran nuclear deal, which Trump has criticized harshly, and forge a new approach that would also incorporate other U.S. and European concerns. On Tuesday, the two leaders pledged to seek stronger measures to contain Iran but Trump made no commitments to stay in the 2015 nuclear deal. He also threatened Tehran with retaliation if it restarted its nuclear program. Macron has pushed for a new approach that would see the United States and Europe agree to block any Iranian nuclear activity until 2025 and beyond, address Iran’s ballistic missile program and generate conditions for a political solution to contain Iran in Yemen, Syria, Iraq and Lebanon. Macron added that Iran will “never” be allowed to develop atomic weapons. “Whatever the decision of the United States will be, we will not leave the floor to the actions of rogues. We will not leave the floor to this conflict of powers in the Middle East,” Macron told Congress. “I think we can work together to build this comprehensive deal for the whole region, for our people, because I think it fairly addresses our concerns,” he said.